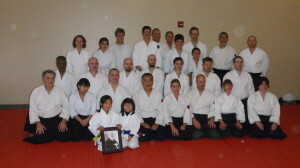 On Saturday, 16 November 2013, Kiryu Aikido participated in the biannual Aikido testing in our dojo community, which includes Tanshinjuku and Doushinjuku dojos. Thanks to Kei and Mariquita Izawa Sensei and the students of Tanshinjuku for hosting the test and for your welcoming spirit, as always. Thanks also to the Kiryu students who came to offer their support for others testing in this important milestone. We had one student testing: Cyrus Blevins for 5th kyu. 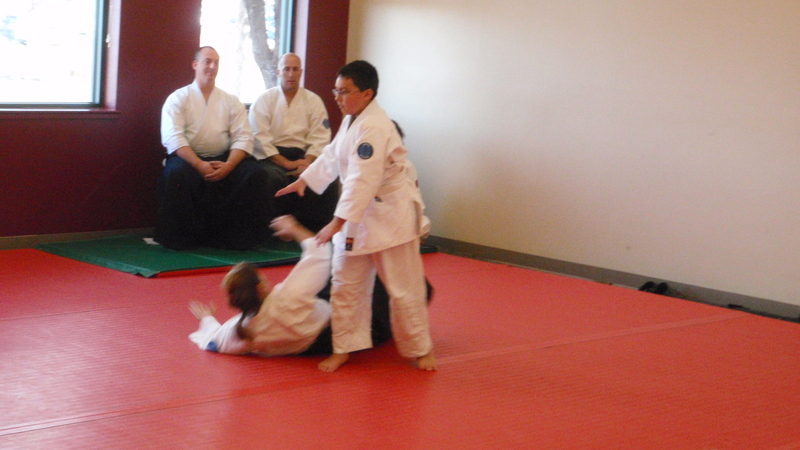 He did a great job and represented the dojo well through his preparation and commitment, which resulted in confidence, strong techniques, and zanshin. 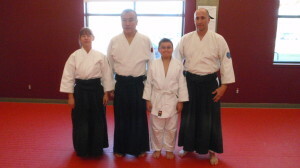 These are things I believe are hallmarks of the special spirit of Kiryu Aikido. Every test is an opportunity to see students’ progress and the results of the work they have put in leading up to the test. It’s heartening to witness the growth and increasing abilities that students can exhibit when they practice over a long period of time. 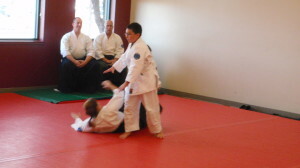 A few things came to mind during the test, and perhaps the biggest take-away is that the elements necessary to have a great test also apply off the mat. Perhaps these can be summed up in one idea: how we practice is who we become. During a test, we can only demonstrate what we have been practicing for weeks and months (and years). If we’ve been practicing diligently, and have accepted that true learning comes from a conscious decision to get of our comfort zone class after class, our test will exhibit the focus and spirit we’ve brought to every practice. If we’ve been just going through the motions, that will be reflected in our tests. Neither is good or bad, either is a choice, but it’s undeniable that we are what we practice. So as this test is wrapped up, and before we bow in to practice next week, it may be helpful to take an objective look at our own practice. What can we improve? What are our weaker spots and those that need more attention? What are our strengths that we can improve even more? How can we be better kohai? Better sempai? How can we get the most out of our precious time on the mat? 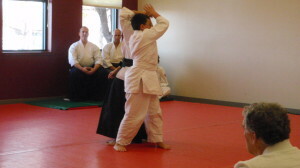 Kiryu Aikido is about strong technique, solid ukemi, and good martial spirit, and I appreciate the shared commitment we all have to these foundations of our practice. I believe also that the physical effort put forth on the mat can result in positive life traits that will take us far in whatever career we have. Focus, dedication, learning, commitment. After all, we are what we practice…and we get out of life what we put into it. Omedetou gozaimashita (congratulations) to Cyrus-san and all the students who tested. Keep up the good work, and we’ll see you at the spring test. Thank you Kara-san for the well written summary of the testing. It was very nice to see all Kiryu Aikido students supporting Cyrus-san, and other Aikidoists. Congratulations to all that tested. You did a wonderful job. What I like most about this test was the youthful aikidoists. It was great to watch their smiles after they did a technique and after testing.